Established in 1979. A lot has happened in 35+ years. This History page is a work in progress as we try to put dates to significant historal events that have taken place in 3 plus decades. We'll also try to come up with some photos from the early years. 1792 AD: Mount Hood is named after British Admiral Samuel Hood, who never set foot on the mountain. 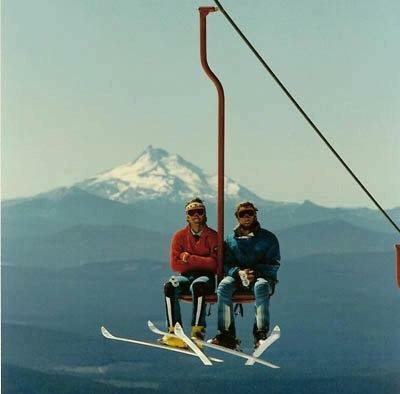 1978 -Palmer Chairliftt opens (named after Joel Palmer, an Oregon pioneer), launching the summer training industry on Mt Hood. In October of 1978, Mike Annett drove across the country from New York with 4 ski racers to do some downhill race training on this new Palmer Chairlift. Two other racers met up with the group at the Portland airport. While the U.S. women's ski team were training downhill on the palmer snowfield, Mike had his group doing the same out on the Zig Zag Glacier on the west side of the chairlift. They trained for a week, then road tripped home. Mike realized the potential of summer skiing and made the decision to start offering camps begining that next summer. 1979 - Eastern Downhill Camps was the original name of the camp. The camp was for alpine downhill training only in the beginning. There were four 2-week long sessions offered that first year. And a total of only 23 kids. 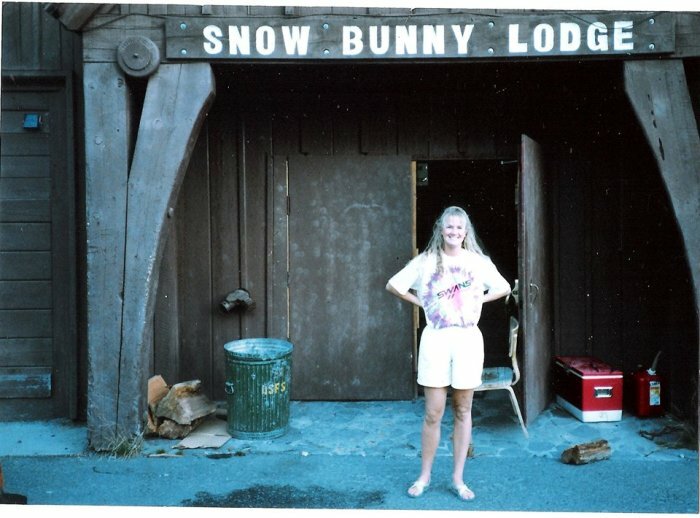 We did our lodging at Snow Bunny Lodge, which has a history of it's own. The two summer chairlifts (Magic Mile and Palmer) were double fixed grip chairlifts. 1981 -GS and Slalom were added to the menu. 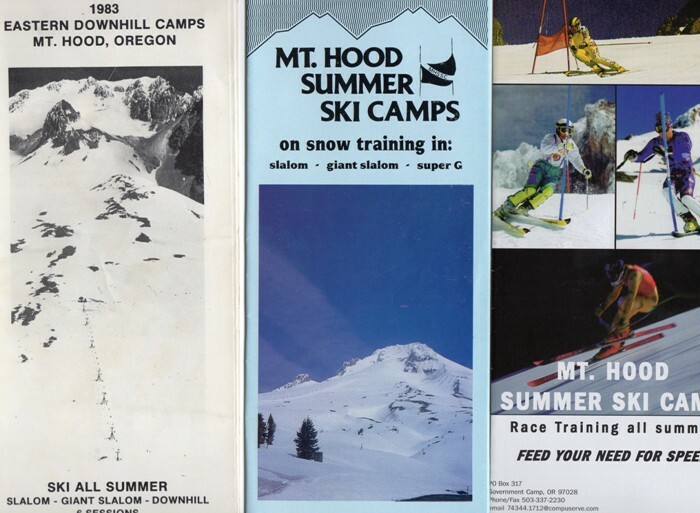 1984 - The camp was re-named Mt Hood Summer Ski Camps. 1985 -12 year old Daron Rahlves came to camp. He retired from World Cup racing at the end of the 2006 season with 12 World Cup victories and a World Championship Gold Medal in 2001 in Super-G.
1986 -The blue bus was purchased by camp director Mike at a government surplus auction in Auburn, Washington for $1,500.. Everybody seems to have a story to share about the infamous camp blue bus. It stayed in our fleet of camp vehicles for 16 years. 1987-The camp t-shirt! The camper that the image was made of on the back of this tee was none other than famous opera singer Ivan Gancedo; from Argentina. 1988 -Snowboarding became an afternoon activity. 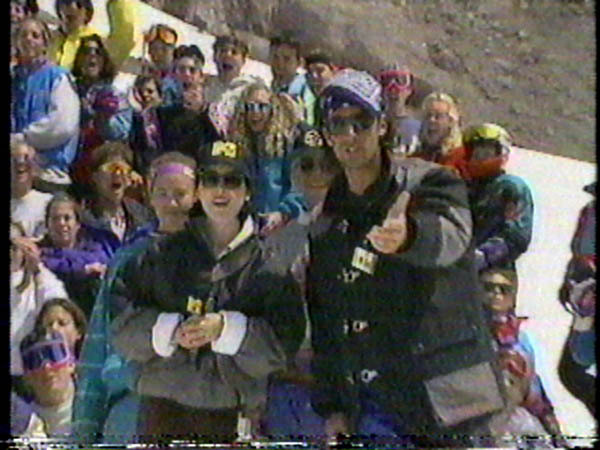 The lifts were closed in the afternoons, so we'd take a group of ski race campers and a camp counselor back to the ski area, hike up the mountain aways and try their hand at snowboarding. Burton donated 5 state-of-the-art boards for our cause. There were no snowboard camps on Mt Hood back then. It was roughly 80% ski racers, 15% freestyle/mogul skiers and 5% public skiers roaming the glacier. 1989 - Burton donated 6 snowboards to our camp and we added snowboarding as an afternoon activity option. Lifts were closed in the afternoons, so we just hiked up from the parking lot. 1990 - Bumps, Jumps & Moguls was added to our camp menu. 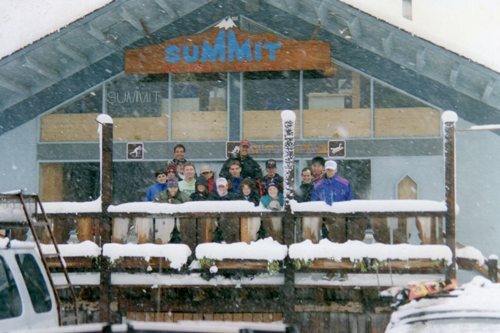 1992 -Camp headquarters was moved to Summit Ski Area lodge. 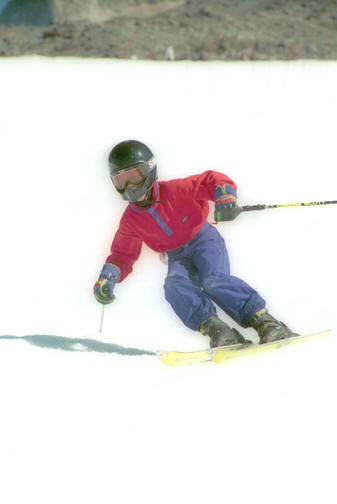 1992 -The Magic Mile chairlift was upgraded to a high speed quad chair, more than doubling the uphill capacity. 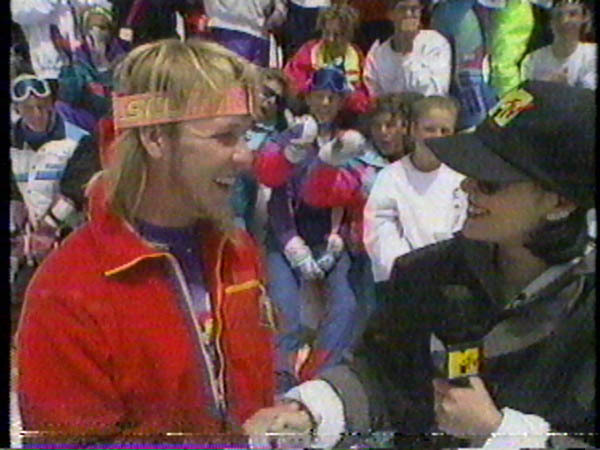 1992 -MTV (Music Television) came up to camp and shot an episode of "Beach MTV" at the top of our race lanes on Palmer. Actors Dan Cortez and Alyssa Milano were the hosts and they used several of our campers and coaches in their program. 1993 -Mogul camp was added to our offerings. 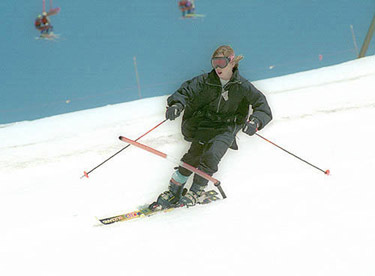 Mogul skiing became a medal event at the 1992 Winter Olympics in Albertville, France and the demand for mogul training quickly grew. Our most noteworthy mogul coach alumni from those early years was 4-time Olympian Minna Karhu from Finland, pictured below. 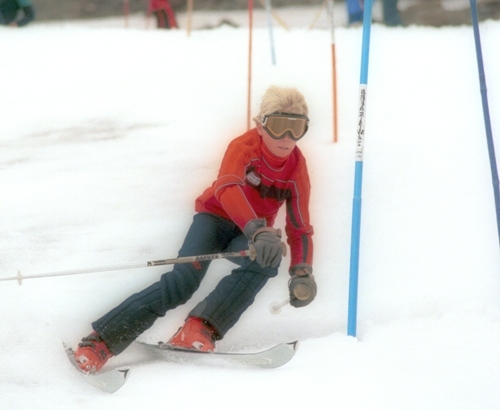 1994 -Racers Ted Ligety (age 9) and Julio Mancuso (age 10) both attended our camp. They've both gone on to have amazing ski racing careers. Ted has won 19 world cup races (all in GS), a gold medal in the 'combined' in the 2006 Winter Olympics, plus 4 World Championship gold medals on his resume too. Julia has 3 Olympic medals, including gold in the Women's GS (Her three Olympic medals are the most ever for a female American alpine skier). She has also won five medals (two silver and three bronze) at the World Championships and seven victories in regular World Cup competition. 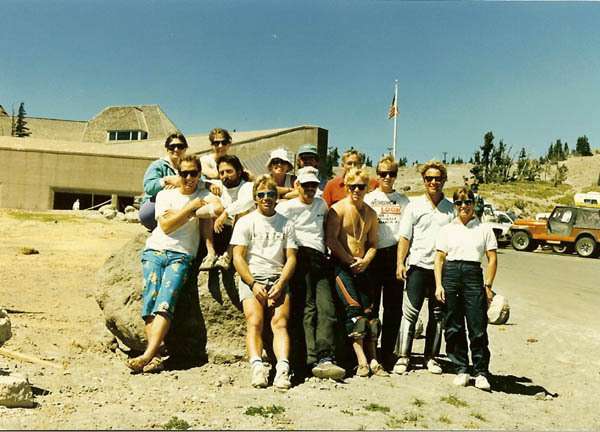 1995 -Mt Hood Summer Ski; Camps registered the website name "mthood.com". Mike Annett and son in law John Bard teamed up to design version 1 of the camp website. 1996 -The Palmer chairlift was upgraded to a high speed quad chairlift, resulting in shorter lift lines and quicker trips up the slope. 1998 -Our new camp lodge opens. It was designed by early 80's MHSSC coach, Fred Loesberg. 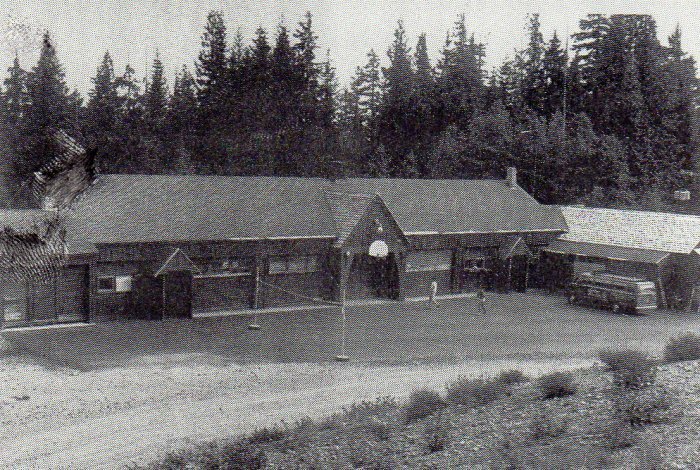 Years later, the lodge is named "Chinook Lodge", although most people still call it the "main lodge". 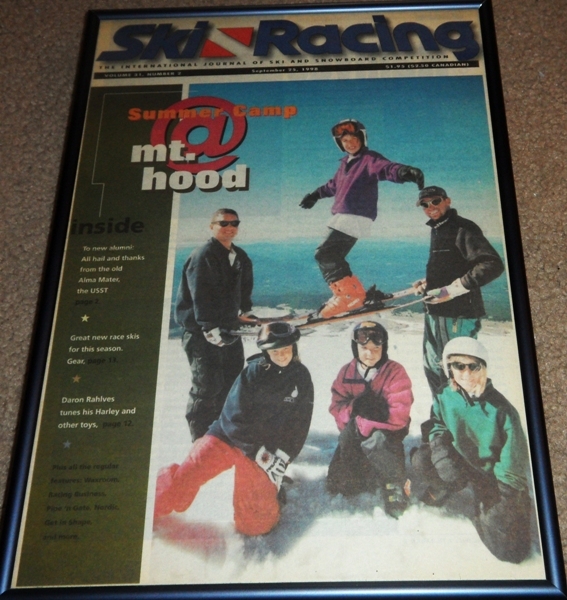 1998 -We made it onto the cover of Ski Racing magazine! 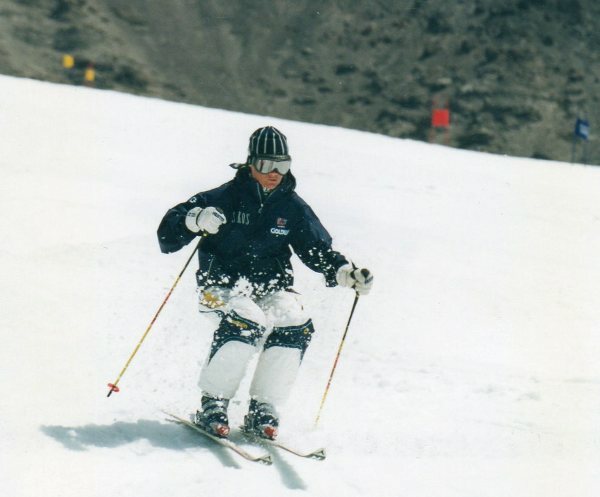 1999 -The first summer MHSSC had its own private terrain park. 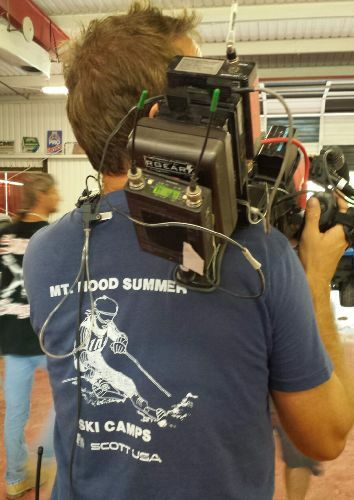 1999 -"Good Morning America" (ABC network) sent a video crew out to Mt Hood to do a story on summer skiing, interviewing several of our campers. 2002 -A small earthquake rocks Mt Hood in mid-July. 4.5 on the richter scale. Only a few campers felt it. 2002 -MHSSC Snowboard coach, Mark Stegall, was on the cover of the Sports Section in the Oregonian Newspaper on November 14, 2002. 2004 -The camp zip-line and log-walk are built on the MHSSC campus, out near the soccer field. 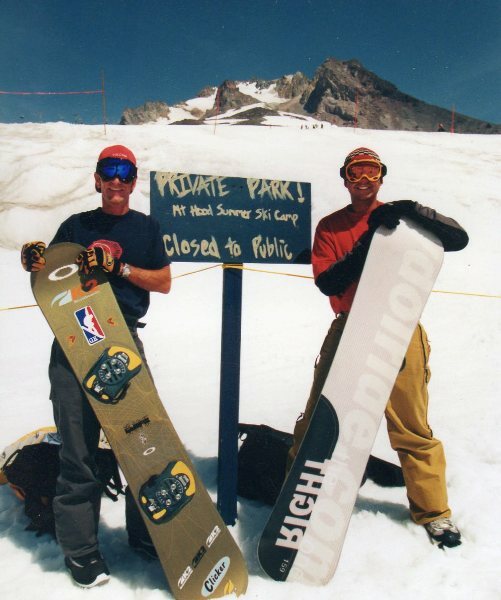 2004 -Mt Hood Summer Ski camps was listed in Outside magazine as one of the top skill camps in the world. 2006 -Gold Medals at the 2006 Winter Olympics for former MHSSC campers Ted Ligety (Men's Combined) and Julia Mancuso!! (Women's GS). AWESOME! As you read above, both were campers with us in 1994 when they were kids. 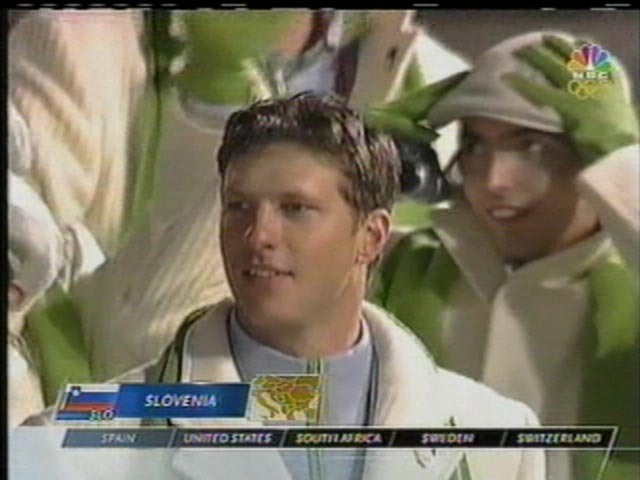 2006 -MHSSC alpine race coach, Andrej Jerman, competes in his 2nd winter Olympics for Slovenija. Photo is a screen shot of opening ceremonies on USA's broadcast. 2006 -Butterflies invade the mountain! ahhhh, run for your lives! 2008 -Session 3: big snow storm in June. Chains required on Timberline road. There was a police office writing $144 tickets for anyone without chains on their tires. We had our 60+ campers ski all the way down the Alpine Trail to Government Camp at the end of the ski day, instead of trying to drive on the slick road. 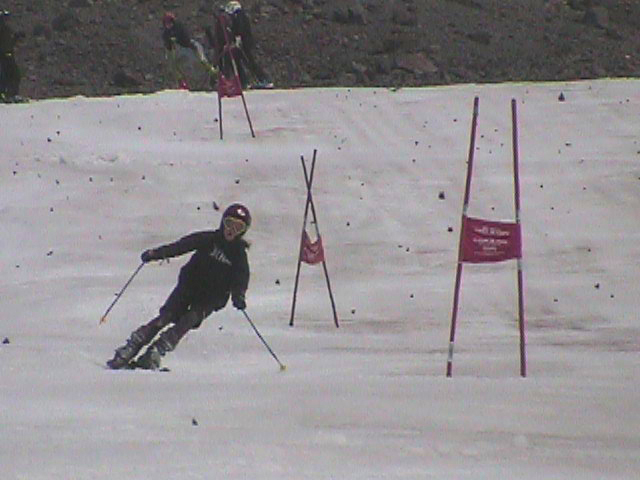 2010 -Mt Hood Summer Ski Camps created its Facebook fan page. 2011 -Long time MHSSC snowboard head coach Mark Stegall past away in April of 2001. He touched countless numbers of peoples lives. Great man. "He was a pro at life"
2012 -MHSSC counselor, Chase Kerzel, breaks the camp record by eating 12 burgers at the camp picnic. 2013 -Oregon Public Broadcasting (OPB) came to camp in mid August to produce a segment about our camp for a show called "Oregon Field Guide". 2014 - 3 former MHSSC campers won medals at the Sochi Olympics! 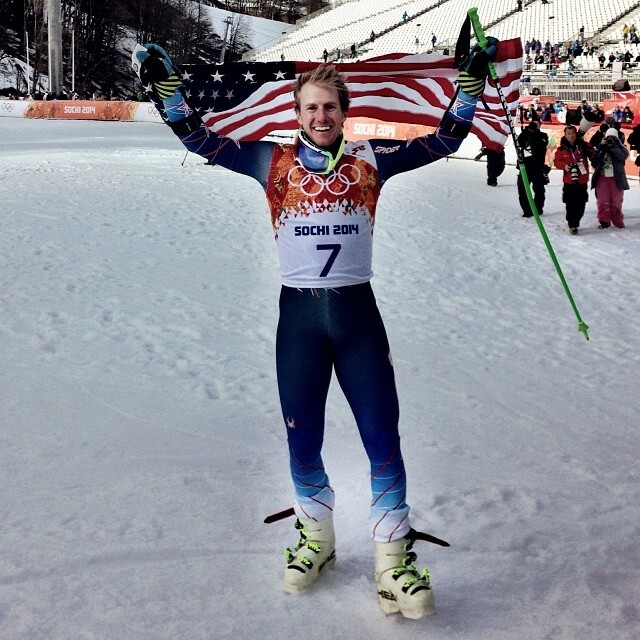 Ted Ligety won the Gold Medal in Men's GS. Julia Mancuso won the bronze medal in the Women's Super-Combined. 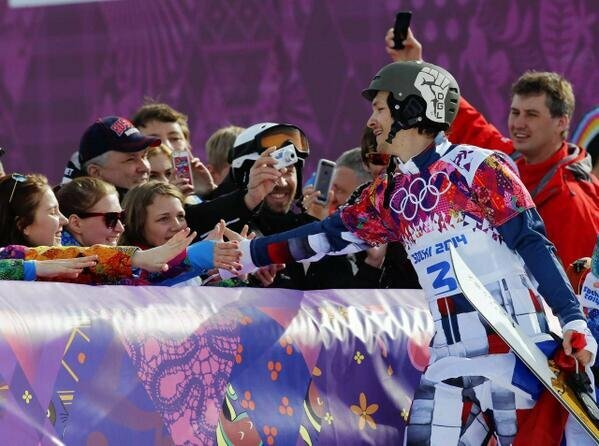 And Vic Wild won TWO gold medals in Men's parallel snowboard race GS and the Slalom events.